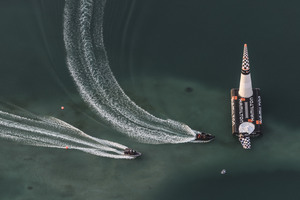 AND WELCOME BACK TO LIVE RED BULL AIR RACE WORLD CHAMPIONSHIP 2017! WE ARE READY... ARE YOU?! go go go. Where is the video feed? Hello to all in the new season! AND HERE WE GO! It's Mikael Brageot, first up in his first Master Class Qualifying! And that's a quick vertical turn for Brageot and 11th fastest in FP3 earlier, he's loving that MXS-R and it shows! Hello Hello! 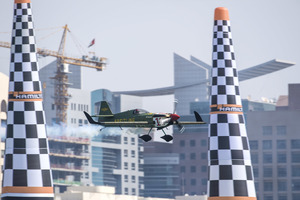 I am so ready for the new season of the Red Bull Air Race! So anyway RBAR Reporter, I made my decision on what pilot will win tomorrow's race. 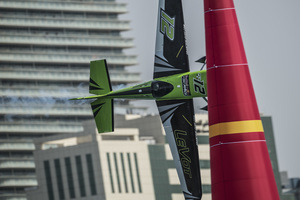 Second of two runs for Brageot... this is all green as he tightens up after posting a solid first run... and he's quicker, it's more than 1s faster! Clean and 53.326 is nothing to sniff at for a newcomer to the elite class! But that's an over G! So it's a DNF for his first run, which puts the pressure on now for his second attempt! And that is the kind of excitement we like! Kopfstein claws that back with 53.221 and moves ahead of Brageot! It's red on the split times and there is the first pylon hi! 3s straight away and he'll have to dig deep in his second run... while our Airgators get busy! And it's all back up and running! Podlunsek is straight back into the track and he's started well but that is an over G and he's blown it! 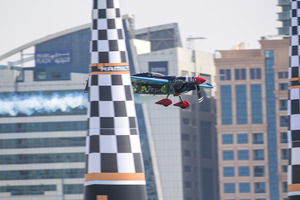 Brageot: "The plan was to be confident in the first run and increase power and performance in the second run. We will do everything we can to take everything out of the Skyracer and give the best performance." Bolton: "As soon as I crossed the start gate it was great. The net time was great. We're here to make it tough for the other guys. The teamwork is excellent and we're in a very positive direction." And Juan Velarde gets the OK from Race Director Jim DiMatteo to head into the track! He's off!